And the people at the 3rd Annual Vancouver Hot Chocolate Festival must feel the same way, as they have invested “23 CHOCSTARS — 27 DAYS — 60+ CRAZY FLAVOURS” to make sure everyone in this city has a chance to indulge in some liquid chocolate luxury, whether the weather be fair or foul. This year, the festival (which wrapped up yesterday), featured 19 locations and different flavours featured on different days to keep you coming back for another. This being a Saturday, half of the good citizens of North Vancouver were crammed into the shop. We squeezed our way in along the counter, and cheerily bellowed out our order. While waiting for it, we indulged in checking out the “secret drawer” in the wall. For those who know, when a particular tile with a circle on it is pressed, a drawer spins around revealing a chocolate, fresh from the kitchen – one of the seconds of the particular batch the staff is currently making. I think the secret drawer is supposed to be for children, but I scored today, with a cherry liqueur infused bonbon – the perfect appetizer for my hot chocolate. Our orders ready, we made our way outside to the “al fresco” tables in the drizzle, however we gave up pretending to like the rain, and retreated to the relative comfort of the car’s back seat, to wrap our fingers around our drinks and enjoy. I’d ordered “THE LUMBERJACK” a Bourbon barrel-aged maple syrup hot chocolate, which was thick, rich, loaded with dark chocolate flavour, absolutely delicious served with a tiny Douglas fir-infused chantilly, maple & vanilla shortbread. Younger Son went with the “MALTEASER”, a Barley malt-infused hot chocolate, served with a salt caramel malt truffle on a lollypop stick. He didn’t actually manage to finish his, as it was very rich, so I “helped”, once I’d finished mine. A good, almost “chewy” mouth feel. 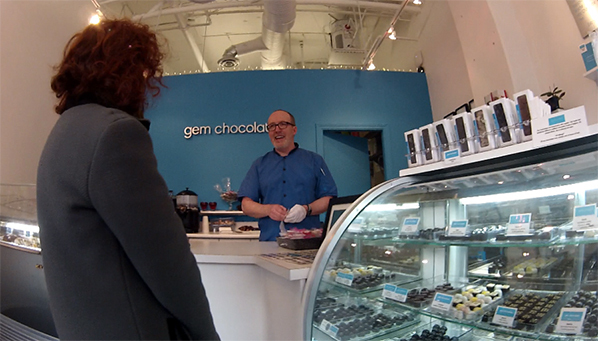 Glenn was busy with the brisk Friday afternoon stream of regulars, from the school girls who come in for gelato to the fashionable ladies buying some exquisite bonbons. He took a moment from his steady stream of customers to concoct for us two excellent cups of hot chocolate, and slipped us a sample of a crème brulee bonbon he has been working on. 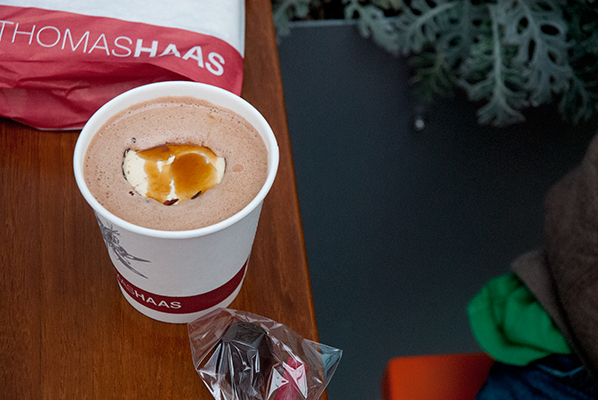 We had the “MONTY’S HEAT”, a spicy hot dark chocolate. 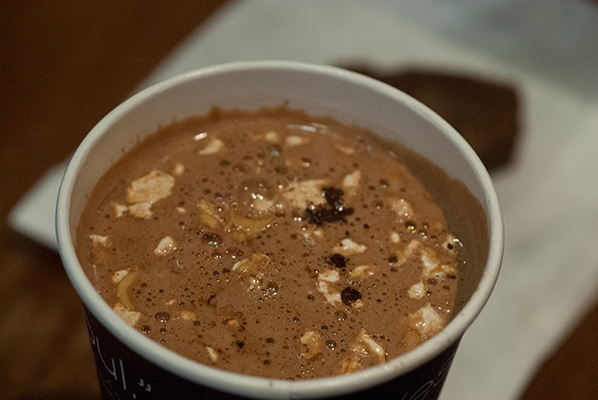 This was my absolute favorite of all the hot chocolates I tasted. The combination of cardamom, cinnamon and cayenne balanced the rich unctuous chocolate perfectly with a nice little kick, and the marshmallow sank to the bottom, but held enough shape to be scooped up and savoured at the end. 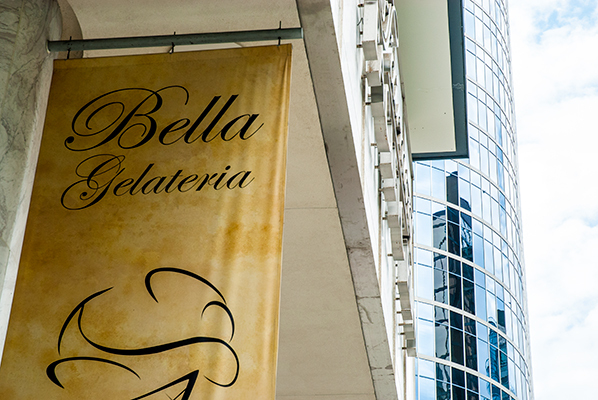 Bella Gelateria’s James Coleridge makes award winning gelato, and this past spring, took home first prize at the Firenze Gelato Festival for his salted pecan and Canadian maple syrup gelato (noce pecan e sciroppo d’acero Canadese). I decided to try the hot chocolate version of it, and it proved to be a very interesting cup. The salt taste of crunchy pecans hit my palate right away, were plentiful, and I have to say, for me, a bit strange. I think I would love this combination in a gelato, and I admire the daring in flavour combinations and textures, but I think that day, I would have preferred a smoother, simpler chocolate taste, and I probably should have stuck with the Devilish Dark – a straight up, dark chocolate. A big generous cup, however. The boys went for the “ITALIAN HONEY MOON”, a Honey nouget and hazelnut chocolate made with Avalon Organic milk and Michel Cluizel chocolate. One of the boys opted for milk chocolate, the other for dark. Their conclusions were similar to mine – they remarked at how generous the size of serving was, the chocolate taste deep and delicious, and especially, the generous amount of hazelnuts. A really nice flavour combination, however, they would just have preferred a smoother texture. A matter of preference, of course. They had an interesting experience, and I include their review here. 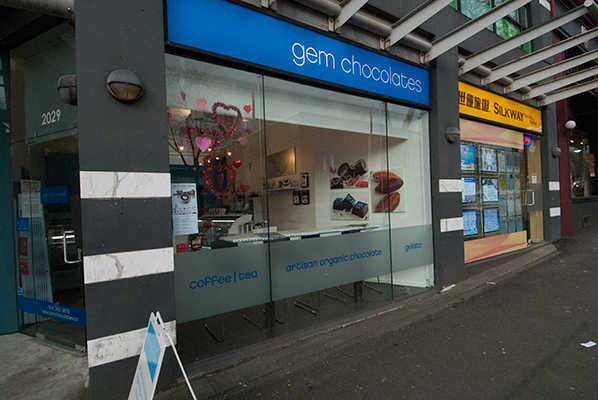 We likely would not have discovered this cafe if not for the Hot Chocolate festival as it is quite hidden away. The cafe is beautiful from the outside, very quaint and French, fitting well with the name. When we arrived at the cafe, there was a sign on the door that read ‘closed’; it was early in the day so we were surprised to see a closed sign. There was a patron seated in the cafe, so we gingerly stepped inside and asked if the cafe was open. We were informed that they were open but had run out of drinking chocolate and were limited on confections, however there was hot chocolate available. The cafe was clean, very quaint and tastefully decorated. We ordered chocolate orange and chocolate rose, the price was quite reasonable for specialty hot chocolate including a complimentary chocolate confection. While we were waiting, we read on the menu board that partial proceeds of the Hot Chocolate festival were going to a charity. The hot chocolate arrived in a reasonable length of time. The hot chocolate arrived in a reasonable length of time. The chocolate was rich and had a satisfying flavour. We both found the temperature to be not hot enough. I love my friend’s comment about seeking out a little place like Chocolaterie de la Nouvelle France because of the hot chocolate festival. It’s a great way to get people in the door, and hopefully coming back in all seasons. Funds raised from the 2013 Vancouver Hot Chocolate Festival will be donated to Vancouver’s A Better Life Foundation. Spearheaded by restaurateur Mark Brand and Canuck Place co-founder Joanne Griffiths, the Foundation seeks to create a self-sustaining meal program for people in assisted living and low-income housing. The program will also create dozens of jobs and training opportunities for people in the Downtown Eastside neighbourhood. Brand aims for the program to feed 1,000 people and more every day in Vancouver’s inner city. However to be able to do so, without Government subsidy, the foundation will need to raise $750,000 — a goal they hope to reach with the help of initiatives (such as this one) taking place independently in the private sector and business community. It, like other winter festivals is the perfect thing to bring people together, and in these last cold days of a (hopefully) dying winter to chase the chill away. And how wonderfully upside-down that this sweet cup of hot chocolate which is the perfect drink in a cold climate, is descended from a spicy, frothy cold drink from a very hot climate – the original xocolātl a word meaning “bitter water”. However you choose to drink you chocolate – bon appetit! If you feel like exploring, here’s a map of the shops that were involved in this year’s festival.